The scent of fried eggs rising from our campsite interrupted our reflections. It was followed by Marc's call 'Breakfast ready!" echoing through the valley. We climbed back down and joined the others. After a pair of delicious eggs on toasted bread we packed our tents and rigged the cars. Our departure was delayed by a punctured tire that needed repair, the first one which would inevitably be followed by many more. The hydraulic jack repeatedly sunk into the soft ground, so Andi dug a pit that I filled with large rocks to support the jack. When we were ready to start, the sun stood already high in the sky. The plan was to search in a southern direction until early afternoon, when the shadows would begin to point eastward. This would be the signal for us to turn east and attempt to cross the Draá Afrafir, a large dune belt that we could already see lurking at the eastern horizon. The scent of fried eggs rising from our campsite interrupted our reflections. It was followed by Marc’s call ‘Breakfast ready!” echoing through the valley. We climbed back down and joined the others. After a pair of delicious eggs on toasted bread we packed our tents and rigged the cars. Our departure was delayed by a punctured tire that needed repair, the first one which would inevitably be followed by many more. The hydraulic jack repeatedly sunk into the soft ground, so Andi dug a pit that I filled with large rocks to support the jack. When we were ready to start, the sun stood already high in the sky. The plan was to search in a southern direction until early afternoon, when the shadows would begin to point eastward. This would be the signal for us to turn east and attempt to cross the Draá Afrafir, a large dune belt that we could already see lurking at the eastern horizon. Andi was driving. It was his premiere in the desert. I was happy to fully concentrate on prospecting, but first I had to find and rearrange some of my gear in the car that, for inexplicable reasons, had become misplaced overnight. This undertaking was complicated by a heavy jolting of the vehicle steered by Andi across the ravines towards the high ground of the plateau. To avoid bruises, one was well advised to always keep a firm grip and to prepare for surprises, but still, more than once, I banged my head on the roof. Chuckling, Andi repeated my advice from the previous day concerning the co-driver’s obligation to watch out for bumps, which I found only mildly amusing. When I had finally secured everything that I needed for a day’s work, I looked up to get my bearings. The first thing that caught my attention was a dark spot, slowly passing by just a stone’s throw away. More by reflex than from cognition, I opened my door, waited until Andi had kicked the breaks, and jumped from my seat. Totally free of any expectation, I approached the dark object. It was a rock. It also was of the right sort, I noticed. The conscious processing of this thought took me a while, though. Frozen in mid-step, I stood there looking at the meteorite, while slowly but steadily the sense of confusion was replaced by an increasing wave of joy. It became so intense that it was hard to bear. To the others I must have looked quite silly, and it was only then that I realized Andi had repeatedly asked what it was that I had found. Grinning from ear to ear I turned and signalled him two thumbs up, which caused the others, who had watched the scene from their cars in the distance, to make a dash in our direction and slide to a halt in a cloud of dust behind our vehicle. ‘Svend’s got one!” Andi greeted them enthusiastically, and we all gathered around the find in awe. In order not to spoil the in situ photos with our footprints, we kept a meter distance from the find and circled the rock as if it was surrounded by an invisible force field. ‘Beautiful piece” Marc acknowledged with the eye of the connoisseur. ‘Very low weathering degree” Rainer congratulated. ‘Must be almost 200 grams” Thomas added. The ink black meteorite on the bright gravel bed was indeed a tremendous sight. A small chip broken from the fusion crust on the top surface allowed us to peer at the matrix, which showed a light tan colour free of oxidation stains. From a closer perspective, the fusion crust with a spider web of contraction cracks resembled the surface and texture of parched leather skin. Judged by the angularity of the surfaces, Rainer concluded that our sample was not the only piece originating from the meteoroid’s fragmentation. Searching the vicinity for additional fragments was mandatory. The find situation needed to be documented, so I went back to the car to get tripod and camera. When fishing for the macro lens, which I was sure I had stowed in the webbing of the rear seat compartment, I was bewildered to find it replaced by a pair of socks, which, this much was sure, were not mine. After some searching, I found the pouch with the sensitive utensil between the steel hooks and towing cables and wondered whether I had indeed been so absent minded to put it there. However, with a more important job at hand, there was time to think about that later. I positioned a scale cube near the meteorite, the ‘N”-letter pointing to the north, and shot some thirty photos from different angles. Then Rainer placed a GPS unit near the stone, and I took another series. Last but not least, everybody wanted a photo with himself and the first meteorite find of the tour. This was particularly understandable since there was absolutely no guarantee that there would be other finds. Marc and Sergey had already returned to their car and continued to grid the wider area pursuing a second piece of the meteorite. Now it was left for me to lift the stone from its gravel bed, upon which it had rested for decades or even hundreds of years. Although (or rather because) I had already been gifted to celebrate this act almost a hundred times, it was nothing short of a sacred ceremony to me. By applying gentle force and with an inaudible crack the meteorite detached from the soil, dust grains blowing off in the wind like pollen off a picked flower. Slowly I turned the stone to appreciate the meteorite’s underside. The contacting surface showed almost no adhering caliche. Instead it presented patches of a most delicate velvety fusion crust that lacked the moderate sand polishing of the upper surface. It was preserved in pristine condition. 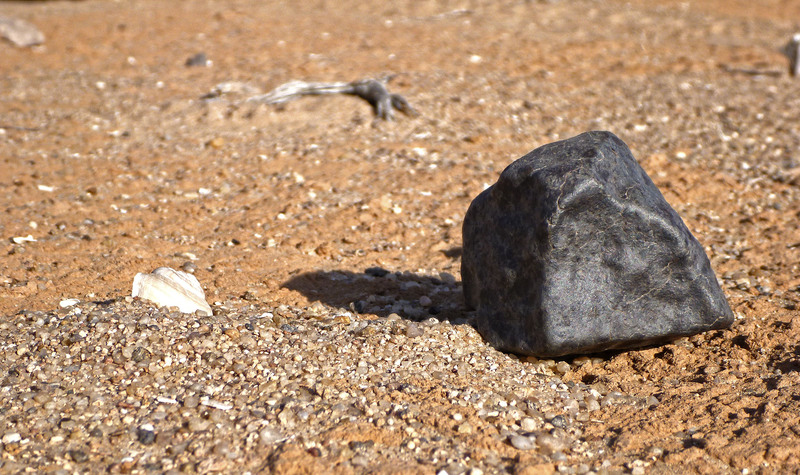 Unlike most other desert meteorites, the effects of terrestrial weathering on this specimen were barely visible. To my great delight, the piece was of undreamt freshness. It was eight years ago, I remembered, that I had last discovered such a well-preserved meteorite. This had been the H3 chondrite Hammadah al Hamra 335, found in 2004 close to the dirt track of Ali Graa Hascha in the Libyan Desert. This time, judged by the few small but distinct chondrules outlined in the fusion crust, the meteorite was a low-metal type and more equilibrated chondrite, probably an L5, or L4 if we were lucky. High up on the plateau and far from the seasonally active drainage channels, the descending meteorite had chosen the perfect resting place. While I saved the find coordinates and wrote them down in my journal, Rainer weighed the meteorite. The balance showed exactly 181.0 grams. Like all further meteorite finds that we would hopefully make during this expedition, following our return, the space rock would be photographed in the studio, catalogued and then samples for the fabrication of petrographic thin sections would be cut. The thin slides would be polished to a standard thickness of 30 microns which made them optically transparent, allowing the sections to be studied using transmitted light microscopy. Subsequently the mineralogical and chemical analysis and classification of the meteorite would be conducted as a joint effort of Rainer Bartoschewitz, who would be using the University of Kiel’s laboratories, and Prof. Hasnaa Chennaoui Aoudjehane at the University of Casablanca. The mandatory deposit sample of 20 g (or 20 percent if the total mass of a meteorite is less than 100 g) would be returned to Morocco and kept at the University of Casablanca to insure that each meteorite found by our team would be represented in the national collection of Morocco. We had already practised this approach with good results following our previous expedition to the Saquia al Hamra in 2010. 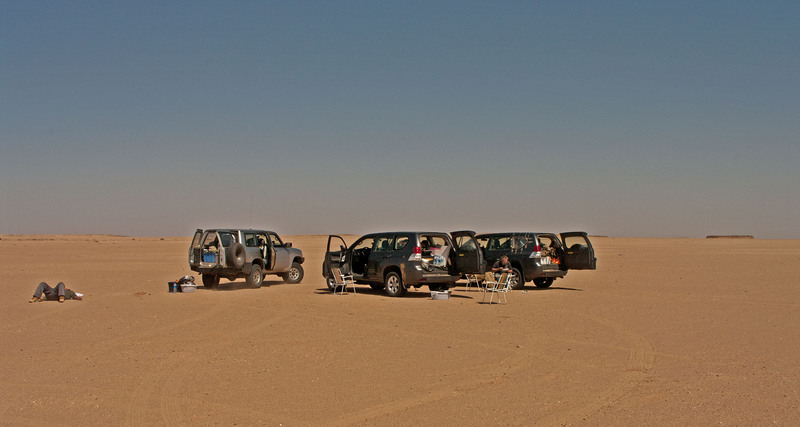 On the prior expedition, it had taken us a full week of searching with three cars, eight hours per day – more than 330 man-hours, and about 650 miles of driving per car – until we had finally succeeded in finding the first meteorite. This time, on our premier full search day, we had already scored before we had barely started. And it got even better. Forty-five minutes after the initial find, about 250 yards to the north, Sergey found a second mass. It was smaller, but in the same near pristine state of preservation and most likely paired with the first meteorite. It seemed our team had discovered a new strewnfield. Although the distance of the two finds was too little to derive an orientation for the strewnfield axis, the two sets of coordinates provided a first point to start from. Andi and I were still standing near Marc’s car discussing the new find, when Rainer rolled past us, sporting a broad grin and pointing to Thomas on the co driver seat, who was proudly holding up a kilo-sized chunk of what appeared to be another meteorite. A third find? We were speechless. Thomas and Rainer’s find could only be associated by coincidence with the first two meteorites, this much could be said on a quick first assessment. The stone was heavily weathered, the metal was probably oxidized to the core, and deep cracks filled with quartz grains intersected the dark brown brick-shaped meteorite. A layer of desert varnish coated the surface and there were no remnants of melt texture left on the old patinated surface. Despite the progressed weathering, it was a genuine piece of space debris. And the fact that it was found only a few hundred meters from the other two finds suggested that our team had located a new DCA, a dense concentration area. Later, Rainer showed us the in situ photos he had taken of the stone, a massive chunk of charcoal black alien matter embedded in the blinding bright serir. A truly memorable sight. Our assumption that we had discovered an area of overlapping strewnfields was soon confirmed by yet another weathered meteorite that Marc and Sergey discovered. Rainer, who had brought an SM-30, a small magnetic susceptibility meter for field measurement of outcropping rocks, drill cores or rock samples, measured the meteorite fragments from the respective find clusters on the spot and confirmed their different compositions. This was a dense aggregation of finds, and from all that we knew such a heavy concentration of meteorite fragments representing different fall events was quite unusual for the area. Quickly we changed our plans and decided to stay another day or two at the spot in order to investigate the new DCA further. Needless to say, our noon break was the gathering of a bunch of exceptionally happy people. Chairs and a table were put up, and we sat down to examine our finds, exchange notes and GPS data. Lunch was mundane and consisted of canned tuna, corn and an apple, and for a while we just sat there, silently in the mild sun on the open plain and enjoyed the panorama. After the cold night, the temperatures in the upper 60s°F felt pleasant. 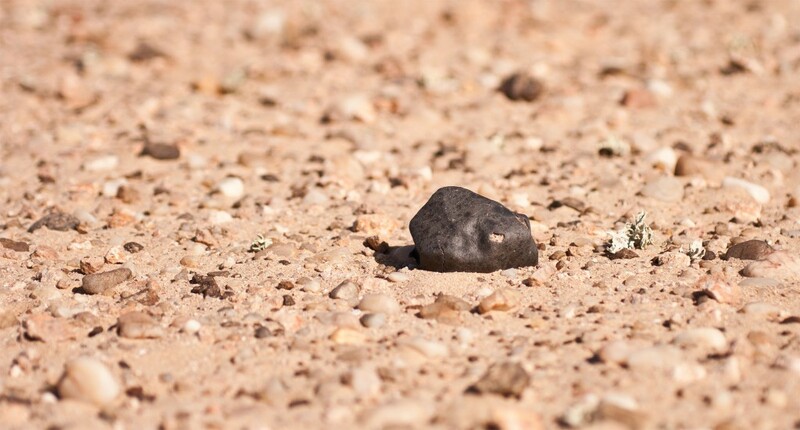 As Rainer told us, they had spotted the weathered chondrite in an area dotted with larger rocks and small shrubs. These areas were actually shallow depressions that intersected the plateaus and were part of the seasonally active local drainage system. Here, on top of the Zamlat Swid, these gullies appeared to be even with the flat surface and were only recognizable as such by the sparse vegetation they supported. Until then, Andi and I had circumvented any active zones of fluvial erosion, and I made a mental note to check these areas more thoroughly in the future. Apart from the fact that the best field of view (and consequently the direction of the search), was dictated by the position of the sun, every two-man crew had its own sophisticated search strategy. Andi and I followed a systematic approach, which meant covering every grid with parallel tracks separated by a distance of about 50 meters. On completing one we would move on to the neighbouring grid, slightly adapting our course to the migrant position of the sun. Marc and Sergey instead applied a rather chaotic set of tactics. Even after three weeks of joint searching, I still couldn’t determine the underlying assumptions of their system. Probably they operated on the basis of a quantum-mechanical theorem, since nothing else could have explained their unpredictable movements and erratic manner of driving. On a normal search day you’d see them circling or zigzagging at the horizon in every direction, sometimes they’d disappear in the east and show up a kilometer ahead of us or vice versa. Since they were highly successful, their search strategy was beyond reproach. In contrast, Rainer and Thomas usually followed a specific direction until almost out of sight, then they would return and start off again in a slightly diverging direction – a tactic that Andi and I had dubbed the ‘Bartoschewitz-fan”. Another difference was their search speed, which was significantly higher than the usual, slightly faster than walking pace that we others applied. On the other hand, they often stopped and searched a selected zone on foot. Statistically, per car and unit time, all three approaches lead to an almost identical number of finds and recovered weight. Although this may sound perplexing, it was obvious that in total only the distance and surface covered counted, and that was almost the same for all three crews. For the afternoon, Andi and I decided to expand our gridding in a northern direction along the borders of the Gart Aouirtefou. Orientation was easy, as we just had to keep the inselberg visible in our mirrors behind us in the southeast. Unfortunately, after another two hours of searching, we reached an area where the light-coloured limestone gravel was littered with a particularly black variant of fist-sized silcrete fragments. These were dark brown to black remains of a duricrust composed of dissolved and resolidified silica that had formed during arid conditions in the Tertiary. 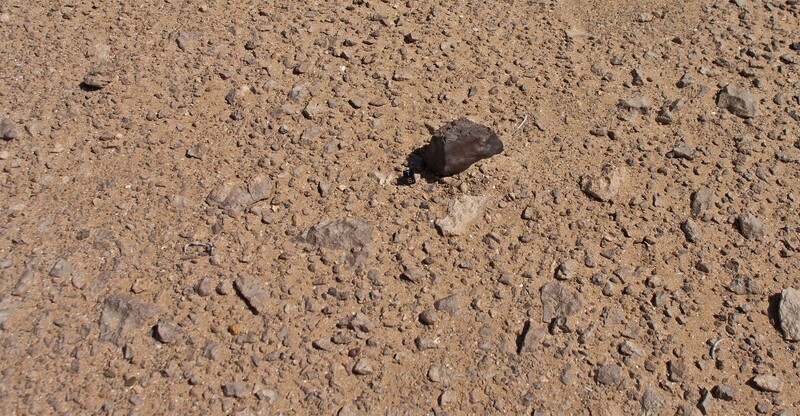 The abundance of this particularly annoying type of pseudometeoritic debris rendered the visual recognition of any potential meteorites that may have been hidden among the black fields almost impossible. In the hope of a better search ground elsewhere we abandoned our track and instead decided to return to the spot of our first find. From there we would circumnavigate the valley counter clockwise. With the sun beginning to lower in the west this would give us a good field of view ahead and to the right for the best part of this course. Another two hours later we reached the northern tip of the valley and we were now again facing the blinding sun ahead in the west. Below us, at the foot of the 60-feet cliff lay the valley floor with its treacherous fields of bottomless fech fech. In the east the terrain gently dipped towards the towering dunes of the Draá Afrafir, which could be seen looming at the horizon less then ten miles away. With limited options at hand we made a choice to take the shortest way back to our rendezvous point and that meant getting down into the valley at our feet and subsequently crossing the Grart Aouirtefou. Together we scouted for a passage down the cliffs and after some walking along the edge we found a natural ramp that, with some good will, could be considered navigable. ‘Might be tricky though” Andi commented at the sight of the narrow slope. I was equally uneasy, and to increase our chances we rolled some larger rocks out of the way before I carefully steered the car down the steep slope. ‘Wow!’ it came from Andi, ‘piece of cake’ I smiled back with newly gained confidence. Then, for a while, we slowly rolled southwards across the Aouirtefou towards our meeting point, looking out for meteorites on our way.